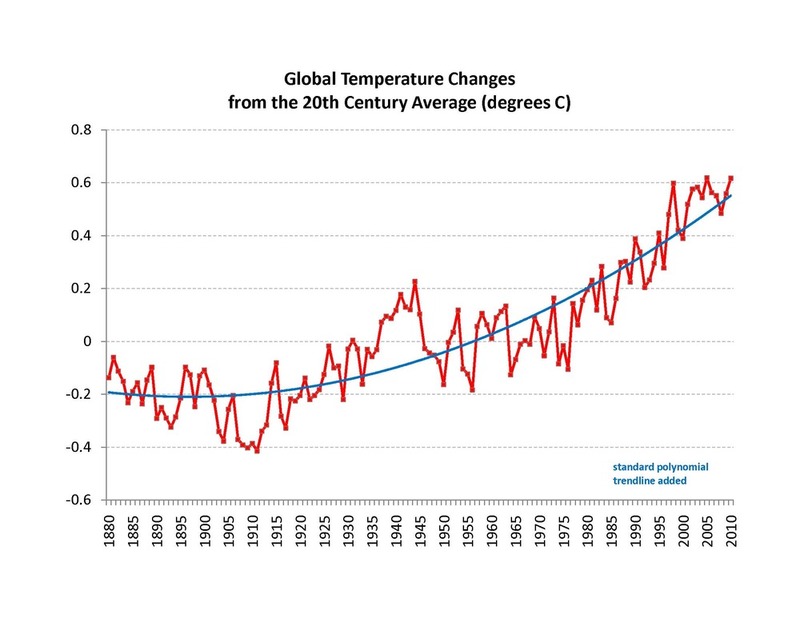 "On record" are two very important words… that graph only goes back to 1880. The earth has been around for 4+ billion years. It's ridiculous to look at that graph and draw any meaningful conclusions because for one thing, if we are looking at the impact of man, at the very least we would need data from times when man was not 'influencing' climate! It would be perfectly reasonable to draw the same graph for 1780 – 1910 and show how the earth warmed significantly from 1816 onward! This is to say nothing of the fact that the earth has been through several ice ages. Ice once covered almost all of North America, and for that to have occurred, and for Chicago, New York, and Seattle to be inhabitable now, the ice must have receded – and how did that happen? The earth must have warned significantly. Manhattan was once buried under a mile of ice (http://en.wikipedia.org/wiki/Last_Glacial_Maximum) – yet the temperature of the earth must have warmed enough that that ice melted. What is now the Sahara was once under water – clearly, warming periods occurred prior to the existence of man! I'm all for ensuring that our approach to life is as respectful to the planet as possible. However, these misleading graphs and poor science (with basically no support in articles other than to say "Look at me!") really need to go. The bottom line is that the "global warming must not exist because of this snow" is a very simple point – it doesn't jive with people's experiences. (Try convincing your average Briton of global warming right now, for instance. My cousins over there are still amazed at how much snow they got, and a friend of mine from Mexico who visited was amazed at the cold there.) We had literally 10 – 15 feet of snow on the sidewalks here in the DC metro area last year (whether through drifting or plowing or both) and I had to walk in the road until almost April! Quite frankly, the climate-change folks, almost all of whom are in academic- or government-sponsored research, can wail and gnash their teeth until they're blue in the face. They're never going to be able to convince people when they can't answer simple objections, and when the average person can see from their window that things aren't hotter. NextPaying Taxes Is Supposed To Get Us Something, Right?